Bird of paradise (Caesalpinia giliesii): growing, planting, caring. Caesalpinia is a genus in the pea family Fabaceae with more than 70 species of shrubs and trees from tropical and subtropical regions, usually deciduous except in the warmest areas. 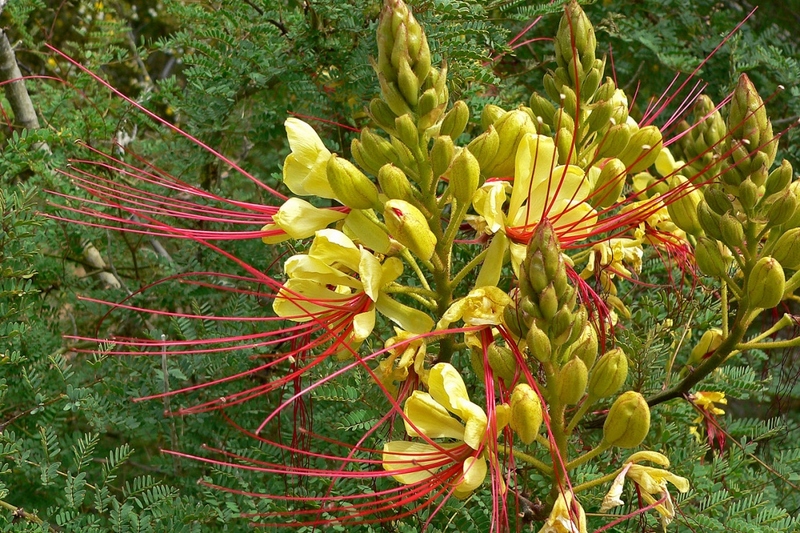 The most common species is Caesalpinia gilliesii, the bird of paradise, a shrub reaching a height of 6 to 10 feet and a spread of 4 to 6 feet, with a spring to summer bloom of large clusters of yellow flowers with long red stamens. The bird of paradise is tolerant of most soil conditions but prefers well drained soils. It will live happily in warm regions, and can handle short frost periods to -20°C. Plant in a sunny spot, and sheltered from the winds. Like most other members of the Fabaceae family, it might not be suitable for growing in containers. Plant preferably in winter, in bare roots or in mound. Dig a hole deep enough, twice as large as the root ball, without mixing the layers of the soil. Plant a solid stake at the bottom of the hole, on the edge, inclined to the prevailing winds. Cut the root hair - the fine roots that looks like hair - to balance the volume of roots and foliage. Plant without burying the boundary between trunk and roots of the tree, putting the soil layers in the same order you removed them. Tamp the soil around the roots with your foot, so you do not leave a pocket of air, and attach the stake to the trunk with a suitable extensible link. Form a hollow in the soil and water abundantly until you fill it. Water regularly and generously for several weeks after planting. After, you only have to worry about watering in case of severe drought. Right after the end of the blooming season, or at the end of the winter, cut back as new growth will occur in the spring. After two years, remove the stake, which has no use anymore and may damage the bark.